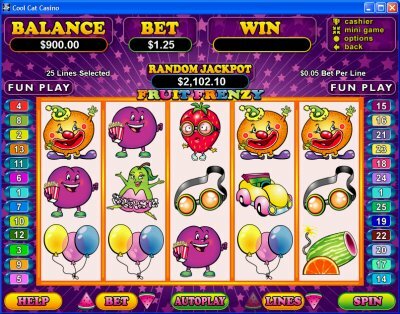 Overview: The fantastic Fruit Frenzy online slot brings all your favorite circus characters and juicy fruits together on one platform. This online Slot has blended the most delicious fruits with all the entertainers from the circus world, to introduce you to the most unusual gambling experience. Banana ring master, orange clown and pear belle dancer join hands to provide you the virtual thrill of a circus. Mr. Pineapple conveniently replaces all the other icons in the game, except the scatter symbols to get you mouth-watering winning combos. 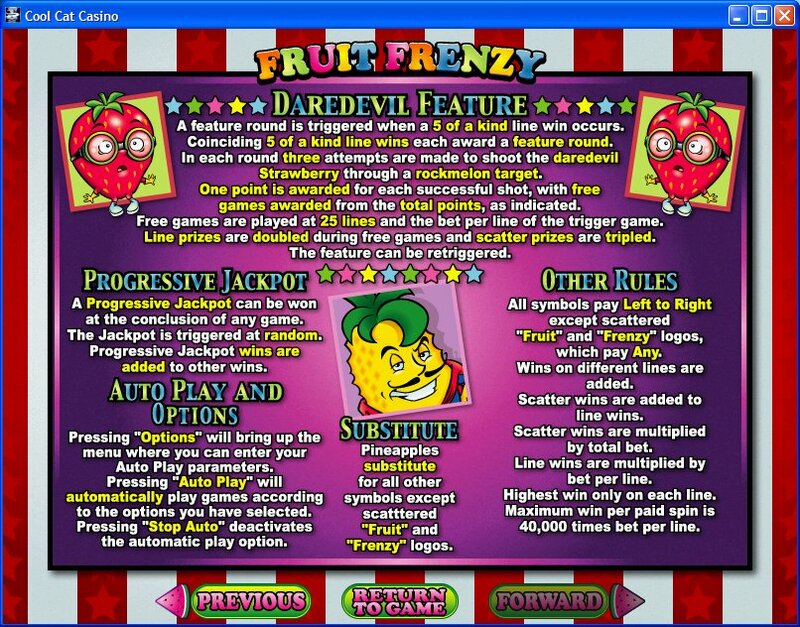 Fruit Frenzy gives you the chance to bet as little as one cent or as much as one hundred and twenty five dollars. Be sure to keep an eye out for the very dashing wildcard Mr. Pineapple as well as the Fruit Frenzy scatter symbol. If you want to play through a specific number of rounds automatically then choose the Autoplay function. Similar Slots: If you like Fruit Frenzy, you might like these other slot machines from RTG: Fruit Bowl XXV, Lucky 8, Lucky Tiger, Red Sands, The Elf Wars, The Naughty List.